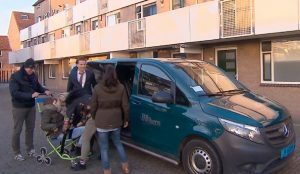 On 15 March, we featured on the TV programme Hart in Actie. We were fortunate enough to be able to help Hans and Petra’s daughters. Their twins have both mental and physical disabilities and urgently needed a stairlift. The programme provided the stairlift. We provided transport for the twins. We were asked to take part in the programme because we look after a lot of disabled transport in the region. Over the years we have built up extensive experience with this customer group and we have an excellent fleet with well-trained chauffeurs. We also always match the right chauffeur with the right client routes. This creates extra security and safety, as it creates a bond between our customer and the chauffeur. View our care transport for more information on our services for people with disabilities.